One of the best things about starting this blog is the amount of people you meet. I have been lucky enough to meet chefs, journalists and PR's, but most importantly of all, I have met many many people who just love food. Two of these people are James and Charlie. Both of these guys love their food, but have taken their passions one step further than just cooking and writing about it. James, or Rambo to his mates (pecs of steel), spent a few months out in the wilds of Ireland at the renowned Ballymaloe Cookery School and now spends his days writing about and cooking food. Charlie, or simply Nels, is a chef who has spent time peeling veg in the kitchens of the Fat Duck and huddled over the stoves at Hibiscus, and now spends his living designing stuff for a food related magazine. Both their lives are entrenched in food and now you get a chance to try some of it. I was a late sub at Rambo's Secret Larder. Some poor unfortunate souls were struck down with some sort of lurgy or another and two spaces made themselves available. Me being gainfully unemployed and my little sister being a student studying for her finals are grateful for any sort of distraction and were more than happy to make up the numbers. Seating 20 split onto 3 separate tables, we all started nattering to each other. It is inevitable that a few groups come together but I was seated with a lovely bunch of old Edinburgh uni students and had a great time. Asparagus, pigs cheek and mackerel were all on the menu and all extremely enjoyable. Charlie, on the other hand, opted for a menu based firmly in Mexico. 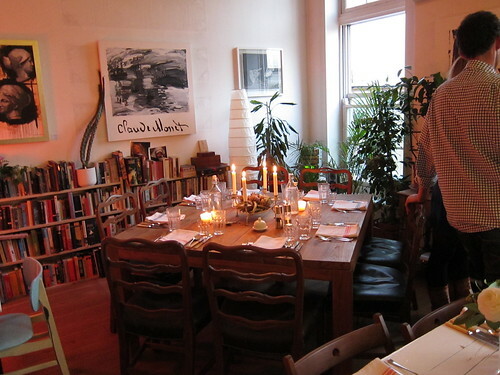 Being his first supper club, it was a night for experimenting. Having a margherita thrust upon you as you enter the flat is not the worst way to start an evening and with homemade nachos on the go, we began to mingle with the rest of the crowd. We were then led upstairs where we were introduced to the main dining area. Again, there were about 20 of us and this time split onto 2 tables. Various delights rolled out of the kitchen and the supper club soon descended into a full on party. 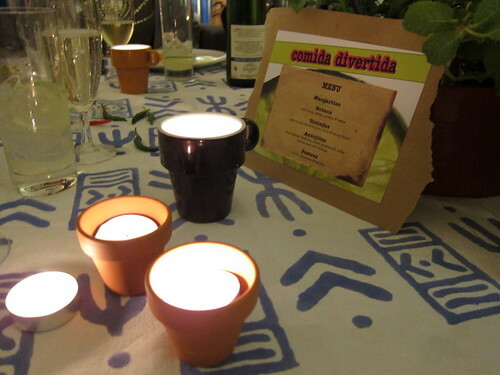 Supper clubs are popping up ten to the penny at the moment, but there is good reason for this. There is a dearth of great chefs out there looking for an outlet, and like any other “business”, if they aren’t any good, they will struggle to survive. I enjoyed myself thoroughly at both of these and would happily go again, and with a donation of £25 suggested, it’s not likely to break the bank. Personally, I say long live the supper club and long live to dining with new friends! The Secret Larder – Somewhere in Holloway. Comida Divertida – Somewhere in Shoreditch.